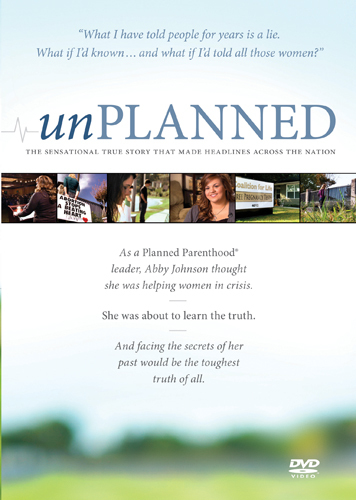 Unplanned is a documentary film telling the story of Abby Johnson who was formerly director of a Planned Parenthood clinic in Texas. She worked there for 8 years, sincerely believing she was helping women. Over the years, she interacted with some of the pro-life protesters "on the other side of the fence" and eventually was convicted that abortion really was wrong the first time she witnessed an ultrasound assisted abortion. She made a decision that day that she could not continue working for Planned Parenthood. She courageously resigned her job, and began helping the same pro-life group she had talked with previously. The film includes interviews with Abby herself, her husband and parents, as well as many of the pro-life activists who had protested outside the clinic where Abby worked. I was very impressed with the spirit of love and gentleness they portrayed to the abortion clinic workers, as well as the patients. It is a fascinating story that is hard to really comment on... I have mixed feelings regarding abortion. Life is full of decisions, and every decision we make has an echo that affects our future. On May 17th at 8:00 PM local time*, come be a part of the UNITEforLIFE webcast with Abby Johnson, a former abortion clinic director for Planned Parenthood. Join us for heartfelt discussions as Abby shares her long-held desire to help women in crisis, and the moment of pure awakening that led her to re-evaluate her life’s work. During this webcast, hosted by Kelly Rosati, Vice President of Community Outreach for Focus on the Family, you’ll discover why Abby is now an advocate for the pro-life pregnancy centers and clinics around the nation that truly serve women and save lives. As part of this blog tour I have a gift certificate to give away that is good for a free copy of the Unplanned DVD. I will mail the gift certificate to the winner, and you can take it to your local Christian bookstore to pick up your DVD, or you can order it direct from Tyndale. "Win a gift certificate for the DVD UnPlanned! @kimmie_1980 http://tinyurl.com/5vjh6wc (05/22) #giveaway"
***Giveaway ends May 22nd @ 11:59 ET!!!! Disclaimer: I received an item at no cost to me to facilitate in this review. I received no other form of compensation, monetary or otherwise, for writing this post. All opinions mentioned in this post are 100% mine, your opinions may differ. Voted for you at We're On The Fence! Voted for you at Top Mommy Blogs! Voted for you at Ola Momma! Voted for you at Bloggers Choice Award 1! Voted for you at Bloggers Choice Award 2! 1 - I added this giveaway to the GREAT GIVEAWAYS section of my sidebar at Create With Joy! 2 - I added this giveaway to the GREAT GIVEAWAYS section of my sidebar at Create With Joy! 3 - I added this giveaway to the GREAT GIVEAWAYS section of my sidebar at Create With Joy! 4 - I added this giveaway to the GREAT GIVEAWAYS section of my sidebar at Create With Joy! 5 - I added this giveaway to the GREAT GIVEAWAYS section of my sidebar at Create With Joy! 6 - I added this giveaway to the GREAT GIVEAWAYS section of my sidebar at Create With Joy! 7 - I added this giveaway to the GREAT GIVEAWAYS section of my sidebar at Create With Joy! 8 - I added this giveaway to the GREAT GIVEAWAYS section of my sidebar at Create With Joy! 9 - I added this giveaway to the GREAT GIVEAWAYS section of my sidebar at Create With Joy! 10 - I added this giveaway to the GREAT GIVEAWAYS section of my sidebar at Create With Joy!